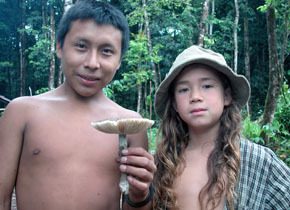 This project documents the diversity of ectomycorrhizal (ECM) fungi associated with host plants of the Caesalpinioideae, Dipterocarpaceae, Polygonaceae, Nyctaginaceae, and Gnetaceae at a variety of spatial scales in the central Guiana Shield (Guyana) of northeastern South America. 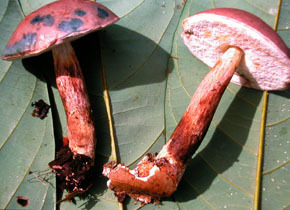 Surveys, collections, and taxonomic description activities combined with belowground molecular-based sampling are identifying the Guiana Shield as a Neotropical hotspot for ectomycorrhizal associations. Our research field sites are remote and hard to get to. 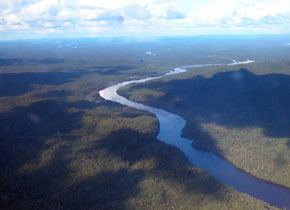 Take a look at some of our aerial shots of various forest areas with ectomycorrhizal trees of the Pakaraima Mountains of Guyana. View our photo gallery of images of some of the interesting people and places that we experience while doing our field research in the Upper Potaro site, Guyana. Catch a glimpse of the amazing ectomycorrhizal fungal diversity of the central Guiana Shield in our photo gallery of recently described taxa. 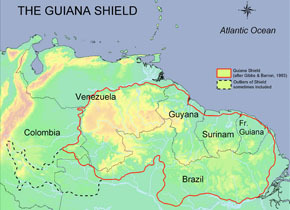 Learn more about the Guiana Shield, a distinct phytogeographic region encompassing Guyana, Suriname, French Guiana, and portions of Venezuela, Brazil and Colombia.